It has been a little over seven years since I bought Vectis, an Alberg 37, built in 1967 at the Whitby Boatworks in Whitby, Ontario (25 miles east of Toronto). During that seven years I have repaired, replaced, or added equipment and systems, with the exception of the 1988 Isuzu diesel engine, which continues to give good service after 3000+ hours. One does not just own a boat like Vectis, one falls in love with her; so I decided the time had arrived to turn my efforts to cosmetics. (Many of you who saw her dirty hull in the harbor this summer will say "Not before time"!). Through the International Alberg 37 Owners Association, I discovered that even though the Whitby Boatworks went out of business in the 80s, one of its employees, Alex Mignone, had taken over some of the space and established a successful business doing both interior and exterior refurbishments of Alberg 37s and other boats. Alex emigrated to Canada from Italy in 1967 and as a cabinet maker spent his entire professional career, prior to founding his current business, installing interiors in Alberg 37s. It sounded like something to check out. On a business trip to Toronto, I visited Whitby and spent a couple of hours with Alex talking about some of the things I had in mind. He also showed me some of the work he had recently completed and I was impressed not only with the quality of his work, but that we shared an appreciation for Alberg 37s. The decision was made. I would take Vectis to Canada, have some work done over the winter, and bring her back in the spring. What I would save in NYC area yard bills would pay for a not-insignificant part of the work I was to have completed. There seemed to be several choices for getting Vectis from Rye to Whitby: on a truck (boring); sail east and then down the St Lawrence (too far and too much up-stream); up the Hudson River, through the Erie and Oswego Canals, and then across Lake Ontario; or have someone deliver it. The more I thought about it the only solution was up the Hudson. How could I let such an adventure slip by? Queen Mary in New York City. Now, it is quite difficult to line up a crew for weekend racing so the chances of finding someone willing to spend a week chugging along at five knots in a canal are really slim. So, I departed Milton Harbor, at Rye NY singlehanded, at 1400 on September 29. I discovered that if you leave just before high tide, you arrive at the Battery in NYC just in time to pick up a favorable flood tide up the Hudson. If you plan on transiting the East River to New York harbor, be aware that the western passage of the East River is closed to leisure craft (near the UN). I was turned around by the Coast Guard, who sent me around the east side of Roosevelt Island. There is a lift bridge linking the island to Queens and a call on Channel 13 used to result in only a five minute delay. Now, for some reason, they require that a fire engine be present whenever they lift the bridge. Luckily the Roosevelt Island Fire Department is only five minutes from the bridge, so my delay was only 45 minutes! The flood tide carried me up to a mile south of the Tappan Zee Bridge, where I dropped anchor under the Palisades at approximately 2100. I picked up the following flood tide at first light on Thursday and spent a beautiful sunny day (interspersed with some rain showers) admiring the mighty Hudson. For those of you who have never seen the Hudson River Valley from the water, you have missed a jewel sitting right on your doorstep! I now understand why the Hudson inspired the many schools of landscape painters over the last century. 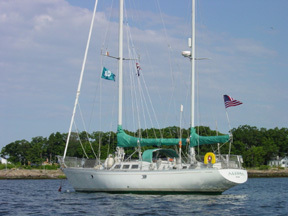 My goal was to reach Catskill, NY where I had arranged to have my mast pulled. However, I ran out of daylight and on the recommendation of the Cruising Guide to the New England Coast, I pulled into Saugerties, an original Dutch Settlement in the 17th Century -- a perfect, but small harbor. I was invited to raft with Bill and Vivian Wood from Charleston, SC, who were completing a "Great Loop" (more on that in a subsequent article) and who also invited me for dinner. On Friday morning I made the short hop to Catskill where I spent most of the morning preparing to turn Vectis into a motorboat. This was completed by 1400 and I managed another three hours upstream before darkness again took over. After anchoring near Stuyvesant, NY (approx. 14 miles south of Albany), I realized I had no way of displaying an anchor light! I spent an unsettled night waiting to be demolished by an errant barge and kept awake by the nearby railroad whose trains seemed to choose Stuyvesant to sound off their whistles every 30 minutes or so. Saturday saw me at the Albany Y.C. at 1000 to pick up a canal permit. The NY canal system is now run by the New York Canal Corporation, a subsidiary of the NY Thruway System and they extract a reasonable fee for a 10-day pass. By noon I had met up with friends Mike and Josephine Shea at the Troy Marina, just south of the Federal Lock at Troy. We had an excellent lunch of burgers washed down with pumpkin beer brewed on the premises. There was also a Saturday Farmers Market there, so I stocked up on fresh vegetables and milk. Josephine also presented me with a Dutch Apple Pie, which did not fit my no-carb diet but made three wonderful breakfasts. A man has to eat. The first five locks at the eastern end of the Erie Canal rise the highest in the shortest distance of any in the world: 150 feet in three miles. Having never used a lock before, I found entering one of these 35-foot high caverns single-handed somewhat daunting. Mike and Josephine had kindly agreed to help out until I learnt the ropes (sorry about that pun) but we then found out that getting a taxi at Lock 6 back to their car at Troy Marina was impossible, so Mike and I did it double-handed. Josephine and baby William met us in a heavy downpour at the top of Lock 6. Mike jumped ship and bid me a soggy Bon Voyage! I cannot express enough gratitude to both Mike and Josephine for their help. Actually once you get the hang of it, locking in and out is not that difficult but you do need to be properly prepared. I suggest tying extremely large fenders: one near the bow and one near the stern, plus a fender board amidships with three or more large fenders. There are several different ways of attaching yourself to the lock wall and over the next several days I developed techniques for dealing with different types of locks. Disposable vinyl or latex gloves are also sine qua non. The Erie Canal wends its way through the Mohawk Valley, sometimes it is the Mohawk River and sometimes it's just the canal. Although this does not match the majesty of the Hudson, it has its own beauty and all kinds of wildlife. Unexpected sightings included a bald eagle, several kingfishers, ospreys, and an otter. I won't go into all the details but during the next two days I negotiated 24 more locks, went 15 miles across Lake Oneida and passed through Amsterdam, Utica, Rome, and the outskirts of Syracuse. Don't ever stop at Canajoharie, NY. The NYCC Terminal there is 50 yards from the NY Thruway, 50 yards from the railroad and adjacent to a bridge joining this "charming" village to the equally exciting village of Palatine Bridge. Despite advertising two interesting restaurants, they were both closed by 1800 and I dined at Mickey D's. I had a second disturbed night in which the constant train whistles were augmented by the sounds of trucks using their engine brakes. I woke to thick fog and ice on my dodger. Thank goodness for thick sleeping bags and radar! Tuesday afternoon brought me to Three Rivers where the Oneida River meets the Oswego River. There is a sign there showing Buffalo 192 miles to the left and Oswego 24 miles to the right. I had by now started downhill (the first 22 locks take you up) and arrived in Fulton, NY, at 1630. The locks only operate between 0700 and 1700 so there seemed little point in proceeding further that day. Fulton offered both a brew pub (out of business!) and the Lock III restaurant, where I had a surprisingly good meal. An early start on Wednesday, October 6, got me to my destination, Oswego Marina, on the shores of Lake Ontario. By 1100, Vectis was a sailboat again. I spent a couple of hours cleaning up the boat (and myself: Do you know how good a shower is, after a week?) and was on a bus to Syracuse where I hooked up with Amtrak back to the Big Apple. Vectis spent two weeks in the Oswego marina waiting for my return whilst I waited for a weather window. The prevailing winds are from the west, which can make for a slow and uncomfortable slog up the lake. On Thursday, October 21, I drove back to Oswego on a dull and chilly day wondering if the forecast for a bright and sunny Friday, with wind out of the southeast, would come to pass. Well, for once the weatherman got it right. The low that had created the drizzle was pushed offshore leaving clear skies and a 10-15 knot easterly breeze. I spent most of Friday getting the boat ready for the crossing. I drove down to Syracuse and picked up Chris Punter from the train. Chris is one of the regular Allegra Bermuda Race crew and lives in Toronto. He seemed like a perfect choice to join me to sail across the lake. Not only does he know Lake Ontario well, he is an experienced sailor and good company. After a good meal in a local restaurant, we departed Oswego at 2100 hrs on Friday. It was a perfectly clear night with a half-moon. Our course was approximately 300 degrees magnetic and the GPS showed our destination to be 104 nautical miles. With the wind almost due east we were able to broad reach almost the whole way. We tacked down wind to keep the wind a little further forward and were thus able to keep boat speed above 6 knots most of the time. (Vectis is only 26 feet on the waterline). Interestingly, speed over the ground was often above 7 knots, indicating a favorable current. As there is no tide in Lake Ontario, the currents must be purely wind driven. We agreed to stand 2hr. watches and I promptly hit my bunk at 10 PM. I relieved Chris at midnight, but let him to sleep until 4 AM. I had managed to get 12 hrs the night before (there isn’t much to do in Oswego!) and the sailing was so perfect, I did not want to disturb the somber tones of deep-sleep emanating from below. Once we lost the shoreline lights (8-10 miles out) we had the most spectacular view of the heavens and watched with awe as the moon set in the west and Venus and (we think) Mars rose behind Sirius and Orion’s Belt in the east. We arrived at our destination, Whitby, Ontario at 14:30 on Saturday afternoon, 17 hours later giving us an average speed of 6.1 knots. By that time, the wind had risen to 20-25 knots and seas had slowly built to 5-6 feet as we moved west down the lake. Although it was late October, it was surprisingly warm at night. It did not go below 50 F and I attribute this to the fact that the lake temperature was still in the mid 50s. We managed to run aground on entering Whitby harbor. The Canadian Coast Guard had put the buoys in the wrong place! We were helped afloat by a passing powerboat and after docking at the marina, invited ourselves to a party that was beginning in the clubhouse. Clearing customs would have been simple (a mere telephone call) had I not been leaving the boat in Canada for the winter. I had to go to the customs office in person and of course it was not open on the weekend! When I did visit, they were very courteous and helpful, and gave me information about how to claim back GST and PST on the work I was about to have done on the boat. Tuesday morning saw me on the train from Toronto to Syracuse, and then by bus to Oswego to pick up my car. I arrived home at around 1 AM - exhausted. Nevertheless I am looking forward to the return trip in the spring. I am deliberating whether to go east down the St Lawrence and return via the Richelieu River/canal and Lake Champlain into the Hudson River at Troy. I do know I will take some very large fenders and will not be single-handing again through the locks (with a new paint job). To view an article about cruising the Hudson River published August 25, 2006 in the New York Times, please click here.